I just had my first local community screening. A small group of parents, who are active in the community running local children centre’s and working for charities like Homestart, took a couple of hours out of their busy lives to watch and give me some feedback on my film Babyhood. I was nervous about how it would be received by professional parenting and child support workers, and felt a huge sigh of relief to receive a round of applause when it finished! We then animatedly discussed many of the issues raised in the film, from smacking and the need for non-violent discipline to technology and whether real life is boring in comparison, to the isolation of new mothers, and the rampant consumerism we are surrounded by. We also discussed the fact that there are so few decent male role-models for children and the impact this has. Fittingly it was shown at Tell It Parents Action Group headquarters which has a lovely hand crafted sign outside that reads: “it takes a community to raise a child”. I will post a picture of this when i next walk past! From the discussion I also realised that on a campaigning note the film could be used to highlight our terrible government policies towards maternity and paternity leave and pay, in fact just for being a parent. It seems so obvious to me that the government is missing a huge trick. In the name of economic growth they want women in work, and yet they know that bringing up our children well in the first 3 years of their lives is now scientifically proven to be essential to a person’s well-being. We know that the better a child’s early years, then the more rounded an individual will join society in their adulthood. 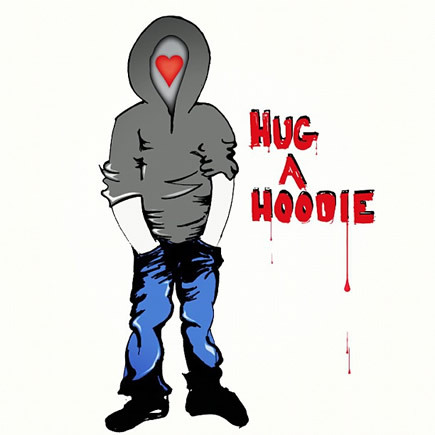 With teenage children being penalized by the media and the government, it really is time for us to “hug a hoodie” (thank you Plan B). Alienating our children is not going to fix the problem, we need to show them some love. I would be very interested to know how many women and men would choose to stay at home for the first few years if there was a way of making those ends meet. It seems so wrong that the responsibility to raise our children effectively is left to the devices of our poor economic policies. In our modern lives, what really is essential? Do we have to pay £50 per month to watch TV? Do we have to buy our children the latest gadgets and video games? Is a ready meal really all we can manage, when to buy the ingredients fresh would be healthier and cheaper? (another thank you here to Jamie Oliver) Are our mobile phones so important that we need to spend hundreds of pounds on them? Not to mention the monthly fee’s. Do we have to surround ourselves with stuff, stuff, stuff? What also struck me was when one parent said the thing with letting small children, i.e. under 3 play with technology was that once they had seen and experienced all that stimulation on a screen, they were effectively hooked. “you can’t take it back”. So while we have a tiny amount of control in their lives (0-3), can’t we keep them away from these devices and allow their stone-age brains to grow without short-circuiting from all that stimulation before they have had a chance to develop the other crucial bits…? Next at last a dvd!